Good writing is like good pasta sauce. The ingredients in a good sauce are simple enough — tomatoes, garlic, onion, basil, oregano, salt, pepper — yet the range and breadth of flavors that can be created with these seven ingredients are enough to fill an entire section of the grocery store. What all good sauces have in common, and good books too, is that they were allowed to simmer so that the flavors could meld. If you are hoping for a positive end result, one thing you can’t do, whether in writing or in cooking, is hurry. Generally speaking, both fiction and nonfiction require some level of research. Although the demands for these two genres are different, good research is nonetheless important for the satisfaction of your readers. During the writing process, you may be tempted to insert your newfound knowledge without much synthesis. This can become a major stumbling block for your readers. Why? When you don’t allow yourself time to process the information you have gathered, you are likely to abruptly switch between the technical aspects of the research and your natural writing style. Further, readers may find themselves distracted by the digressions into historical or technical background. Whereas you, the author, may have intended to create a richer description of a person, place, or thing, the result may leave readers wondering what this detail has to do with the rest of the story. This problem occurs in every kind of writing. As the author, you have to make sure your thoughts are flowing clearly from one to the next and that your inclusion of research improves the reading experience rather than hurting it. With multiple revisions over several weeks, there will be no obvious patchwork, no raw spices. Researching while you write is a contributing factor to this problem, and it can easily lead to the worst gaffe that can come from hurrying your writing: plagiarism. With so much material online, it is too easy to simply copy and paste someone else’s words and pass them off as your own. Avoid the temptation by allowing yourself time to fully understand what you have learned before you attempt to use it. But it’s not just research that needs this simmering time. The manuscript as a whole needs a chance to meld. If it took you a long time to get all of the pieces together — many writers report spending five years or more writing their books — once you type “The End” you may want to jump into editing. Hold on! Give that work of yours some room, come back to it when you can read it from beginning to end, and fix any glitches. Now, it has been suggested to me that setting a project aside for a time to give yourself a fresh perspective may be a luxury that some writers don’t have. Publishers have schedules and they expect their authors to adhere to them. Others might look to some of the prolific best-selling authors, the ones who put out multiple books a year, for examples of when this rule does not apply. Here are my thoughts on those caveats. Although I always encourage my authors to meet their deadlines, I have to also admit that a good 50% of the books I have edited over the past 17 years have been behind schedule at some point. So, if you need more time in order to make a great product, ask for it. You won’t be the first author to miss a deadline. And second, if you aren’t James Patterson, then you shouldn’t expect to produce books the way he does. Many of the top-producing best-selling authors have ghostwriters. You will also notice that the quality of the books tends to suffer over time. Plots are formulaic, story lines digress, and you wonder if the editor was sleeping on the job. It’s clear the author’s name recognition is what sells these books. Although you have a slim chance of reaching fame and fortune churning out book after book, if you have to sacrifice the quality of your writing in order to do it, and thereby risk your reputation, I’m not sure it’s worth it. Of course, this is all coming from a woman who quit her job as an in-house editor because, as a member of the quality control team, she was unhappy with the quality of books the house was producing. I work for myself now. That means I control the quality of my writing and editing and I can take pride in whatever comes out of my office. It’s a good feeling, one that I believe every author should aspire to. Consistent use of numerals (1, 2, 3) versus spelled-out numbers (one, two, three) is one of the most common problems I see in my authors’ writing. Most just type whatever form their fingers choose at that moment, but ultimately a rule of some kind should be established. Some publications prefer to spell out one through nine and use numerals for all other numbers. This is often called the informal numbers rule and is commonly employed in newspapers and magazines. Others prefer to spell out numbers one through one hundred and all large, round numbers (e.g., ten thousand, fifty million). This rule dominates the nonfiction trade book market, which includes general interest, self-help, memoir — most books that are sold in bookstores but are not textbooks or fiction. It is commonly referred to as the formal numbers rule. A small segment of publications use numerals in all instances except in general uses like “I for one” or “for one thing.” I have only seen this in corporate reports, where the press has decided numbers appear often enough that it isn’t worth the time to deal with exceptions. And then there are those publications that spell out all numbers no matter what. This is most commonly seen in fiction, where numbers are used rarely, and when they are used, it is not for exact measurements. I don’t know any cute names for these last two rules, but I do know they are the simplest to follow. That is because they have the fewest exceptions. Exceptions are what make numbers rules challenging even for trained editors. As the author, you can help by choosing the numbers rule that suits your type of book and following it as best you can. It’s highly likely you will make a mistake somewhere — use words where there should be numerals or vice versa — but you can help yourself and your editor by working toward consistency. Like this blog? 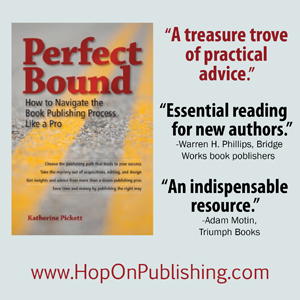 Find more advice and insights in the award-winning book Perfect Bound: How to Navigate the Book Publishing Process Like a Pro, available through POP Editorial Services, Amazon.com, Barnes and Noble, Novel Books, and other fine retailers. When I’m editing I often see writers relying on the same words and phrases throughout their manuscripts. Sometimes the repetition becomes noticeable and distracting, particularly when words are repeated in the same paragraph or sentence. Some words and phrases are more memorable than others. Indefatigable, for example, or invariably, or in an alternate universe will stand out to readers and need to be used sparingly. Now, some words are difficult to write around — work is one that causes me trouble — but others are not so difficult, and if the repetition is distracting your readers from your message, it is almost always worth the effort to find a new way to say something. What can you do about it? First, determine if you are falling into this trap. Reading the passage aloud can help. Stepping away from the manuscript and then reading through from beginning to end is another way to detect the problem. Once you know what some of your “crutch” words are, you can do a search to locate each instance. Then evaluate each use and decide (1) if you need the word at all, and (2) if there isn’t a more interesting way to convey your meaning. Revise as needed. If you want to save money on editing, your first step is improving your writing. Get your grammar and punctuation up to snuff by picking up a couple of language guides. The Elements of Style by Strunk and White continues to be a favorite of mine for its brevity, humor, and accessibility. The Chicago Manual of Style offers the other extreme of long and slightly cumbersome but also authoritative. The Elephants of Style by Bill Walsh is a slightly irreverent guide that covers topics many other books ignore. Random House Webster’s Grammar, Usage, and Punctuation will answer almost any question you may have. Grammar doesn’t have to be boring, and getting familiar with the rules can save you hundreds of dollars. What are your favorite grammar guides?